Long time ago the izrazets, i.e. Russian glazed tiles took quite a special place in Russian applied arts and household. They were used on a wide scale: from tiled stoves and window aprons to decors, bas-reliefs and friezes. The word “izrazets” is of Russian origin. It comes from “obrazets” (translated as “sample”), the word used to denote ceramic decorations for outer walls of churches, palaces and lining of stoves in main chambers. As a rule, the izrazets looked like a box of kilned clay, but without a lid. The front side of the box’s bottom was covered with a painted or relief pattern, and then often glazed with coloured transparent flowing, or with opaque enamel. When starting to make an izrazets the potter would temper clay with his hands, his fingers penetrating inside the clay and removing small pebbles and clots, anything that could lead to cracks during baking. The clay took in the warmth of the master’s hands and became pliable. Then the master would fill it into a wooden mould with a carved ornamentation on bottom, preliminary sanded to prevent from sticking. He consolidated it and pressed into the tracery holes. After processing it on the potter’s wheel he dried it and baked in a furnace. The pattern was not always relief. Sometimes the front side of the box was smooth and painted. The ornaments, be it relief or painted, were glazed or enameled. When tiling walls or stoves with izrazets, the masters compiled friezes, decorative horizontal stripes and panels, platbands, and insets. Sometimes all the outer of inner wall was covered with a sort of an izrazets carpet, making the building look very smart. 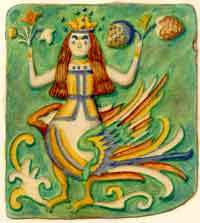 Izrazets tiles could be seen in a boyar’s house, on church walls, or gates of a military fortress. Nothing could possibly make a house look cozier than a stove sparkling with izrazets. The Mongol yoke nearly cut this art short in Russia. it got its second birth together with restoration of ruinous towns in the late 15th – early 16th centuries. Colour returned to Russian architectural ceramics already in the 16th century, declaring its enormous potential on the major cupola of St. Basil’s Cathedral, as well as on other Moscow churches and buildings in Dmitrov and Staritsa towns. 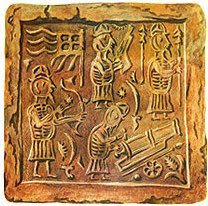 The green glazed tiles became widely popular. Richly attired with tiles were houses and stoves of Moscow, of the wealthy merchant Yaroslavl, Vologda, Veliki Ustyug, as well as many monasterial architectural ensembles. Names of the best izrazets masters of that time have come down to us. These were Ignati Maksimov and Stepan Ivanov, nicknamed Polubes (that can be roughly translated as “Half-demon”). From a paper of the Valdai Monastery’s archive of May 1655 we learn about arrangement of one of the numerous izrazets manufactures that were founded then in the country, and in it the famous master worked. On this fertile soil a unique flower flourished: the all-through-izrazets Krutitski Tower, the crown of this jolly art in Russia, located in the residence of the Krutitsky Metropolitans on the bank of Moskva River. Centuries spared this wonder that has come down to us: the lasting and weather-resistant ceramic tiles and experience accumulated by many generations of masters made it possible for the builders to bring outside rich attire, which had been used only in interiors of palaces or churches before. The façade of the tower covered all over with izrazets tiles really reminds of a carved iconostasis, in which columns and cornices form something like icon-cases, with windows instead of icons inside. Peter the First modified the Russian izrazets in the manner of Dutch tiles, for which purpose he invited foreign masters. In far-away towns and handicraft settlements, far from the tsar’s eye, they still manufactured old-style izrazets, yet it was already the dawn of the original art. Yet, even in the izrazets made after the foreign tiles, Russian masters contrived to reflect their own vision of the world, nature and surrounding things, but the technology of the handicraft and its secrets already started to be forgotten. In the 18th century another name for izrazets appeared in Russia – “kafli”, or “kahli”, after the German folksy name of clay bowls and saucers. This was again due to Peter the First’s fancy for German culture. 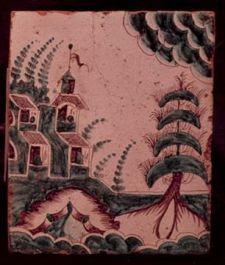 Izrazets of the 18th century became different: it had a smooth front surface, a restrained palette, and a variety of plots performed in a painting technique. The characters of the plots now were people from different layers of society and in various situations. By the end of the century, however, colourful images of flowers, bouquets and birds became prevailing. Ceramic izrazets as separate elements or panels made an integral part of complicated architectural composition of stoves that were the major adornment of the interior. In the 19th century izrazets manufacture became widely spread, with the production made in great variety, both of price and artistic value, designed for a wide range of customers. Izrazets were first of all meant for finishing stoves, which were nearly the main and inseparable part of Russian life. 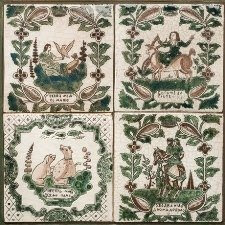 The chinaware and household faience producing manufacture of M. S. Kuznetsov’s, which had quite a special place in Russia, also turned out izrazets tiles on rather a broad range. Thus, the 1899 catalogue of “M.S. Kuznetsov’s Partnership”offered 18 types of stoves and fireplaces, many various kinds of separate izrazets and tiles, two icon-cases and one iconostasis. At the end of the 19th century the art of izrazets flourished in arts and crafts workshops, in particular in the “Abramtsevo” circle that existed under the patronage of Savva Mamontov from 1891 to 1918. Here worked the famous artists Vasnetsov, Golovin and Vrubel, who shunned no handicraft work. Today one can feast one’s eyes upon true Russian ceramics that decorates the Assumption Church in Goncharny Lane or the Church of Grigory of Neocaesarea in Bolshaya Polyanka Street, Moscow. However, the best sample of church tile art is the New Jerusalem Monastery built on Istra River by order of the Patriarch Nikon. Everything was covered with izrazets there: friezes, columns, portals and the iconostasis. Unfortunately now one can only imagine the former splendour of the New Jerusalem Monastery: in 1941 the German invaders blew up the church and it was not possible to restore its initial look.